Kaelepulu wetland is part of several ongoing studies on the ecology and conservation of the `alae `ula or Hawaiian gallinule (Gallinula galeata sandvicensis). Charles van Rees, a Ph.D candidate at Tufts University, Massachusetts, is studying the movement habits of gallinules to better understand the relationships between small populations of the species scattered across Oahu. Birds that move between wetlands help increase gene flow, keep populations healthy, and provide an “insurance policy” for populations at the mercy of ever-changing environmental conditions. Thus, understanding whether or not wetland populations are connected by movement is essential to their long-term conservation. Charles, along with colleagues with U.S. Geological Survey, U.S. 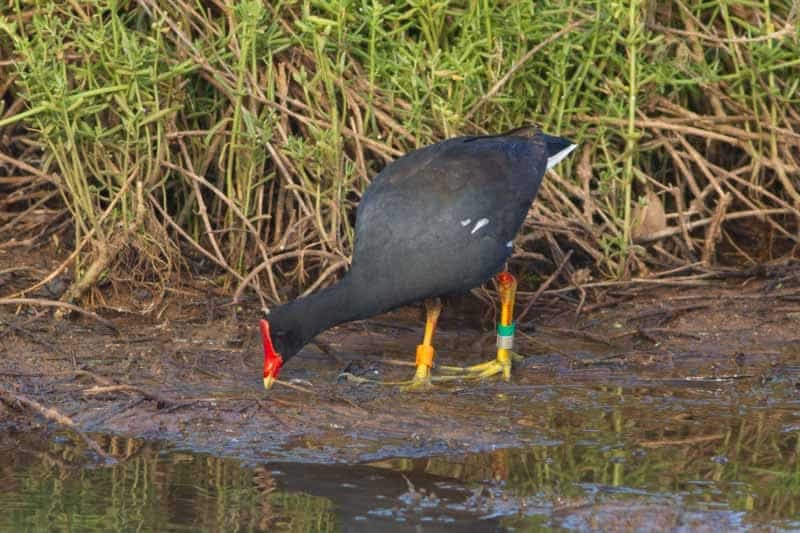 Fish and Wildlife Service, and Hawaii Division of Forestry and Wildlife, is capturing Hawaiian gallinules and outfitting them with colored leg bands for monitoring and identification. He is also collecting feather samples from birds all around the island to use for genetic studies that measure gene flow between populations. Additionally, Charles is studying how to optimize habitat management for Hawaiian gallinules by measuring characteristics of wetlands in comparison to the number of resident birds. This is the second year that Charles has worked at the Kaelepulu Wetland. All 16 of last year’s banded birds have been spotted. A 17th banded bird that moved to our wetland from Hawaii Kai last year appears to have moved on. Interested readers can help support `alae `ula conservation efforts and contribute to ongoing scientific studies by looking for and reporting banded `alae `ula on Oahu at sites.tufts.edu/hawaiianmoorhen.